PC security is top notch priority these days due to ever increasing malware threats across all operating systems including Microsoft Windows, Mac OS, Android, and Linux. Windows is highest affected in this list, while Linux the least. However, I think every Linux user should also install Antivirus software because of cross-platform data transfer between the operating systems. Though Windows virus can’t infect a Linux PC, you don’t want your beloved Linux PC to be a medium of transferring infected files to other PCs. When it comes to PC security, Sophos is a highly respected and famous brand. They have made a free version for Linux that comes with a virus scanner and a removal tool. What more, it also includes a real-time scanner which can detect threats on the fly. Let’s check out how to install it on your P. This guide is tested on Ubuntu 17.10, but should also work on older versions too. Step 1) Go to the Sophos website and download the latest copy of the Sophos Antivirus for Windows. You may have to accept their terms and provide an email ID during free registration. Step 2) The downloaded package is a compressed archive file. It should look like sav-linux-free-9.tgz. The version number may be different based on when you download it. I’m assuming that the downloads are going here. In case it’s different in your case, navigate to it in the terminal using ‘ls’ and ‘cd’ command. Launch ‘Terminal’ and propagate to the ‘Downloads’ directory. Use ls command to list all directories to know where to navigate. Step 3) Use the cd command to go inside ‘Downloads’ directory. Step 4) Again ls command to see contents of ‘Downloads’ directory. Step 5) Use the tar command to extract the contents of the .tgz file. Replace the filename after -xvzf with your downloaded file name. Step 6) You should see the list of extracted content in the Terminal. Use ls command to see inside the extracted content. Step 7) Use the cd command to propagate into the sub-directory. Step 8) Use the following command to run the sh installer. Step 9) Press <enter> and <space> to scroll to the bottom of the super long agreement and enter ‘Y’ to confirm installation. Step 10) You will see a prompt whether to install Sophos in /opt/sophos-av directory. That is typical to Linux directory structure. Go ahead and press <enter>. Step 11) Next it will ask if you want to enable on-access scanning. It is a great feature which will detect malware on the fly when transferring files. It will consume some RAM in the background, but it’s worth it. Step 12) Choose what type of updating you want. I chose ‘s’. Step 13) Key in ‘f’ to select free Sophos Antivirus which will have no support. Step 14) Enter proxy info if needed. I have none, so I entered ‘Y’. When Sophos Anti-Virus starts, it updates itself to try to find a Sophos kernel interface module update. This might cause a significant delay. Sophos Anti-Virus starts after installation. Your computer is now protected by Sophos Anti-Virus. Sophos Antivirus for Linux is a complete command-line tool. There is no GUI for it. Therefore, you need to know the following commands to start using it. How to check if on-access scanning is active? Enter the following command in the ‘Terminal’. How to start on-access scanning? Use the following command to enable and start the on-access scanning, if found that service is inactive. How to run an on-demand scan? Just enter the following command to start scanning your computer. That concludes the guide to installation of the Sophos Antivirus on the Linux system. With a built-in real-time scanner and daily updates to the virus database, Sophos is one of the best antivirus software not only for Linux but across other cross platforms too. Hope you find this guide useful in setting up Sophos and using it. Can you please help me? 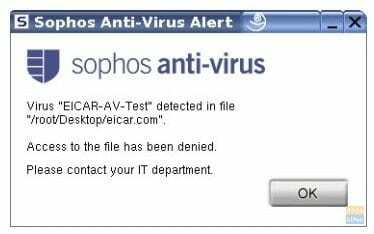 i have installed Sophos antivirus for Ubuntu 16.04. It has installed without any problem, but on-access scanning is not activated. I have tried to activate it through this command “/opt/sophos-av/bin/savdctl enable”. But it shows me Failed to activate on-access scanning. Will you please help me out from this problem. Hello! Thank you very much for the perfect explanation! 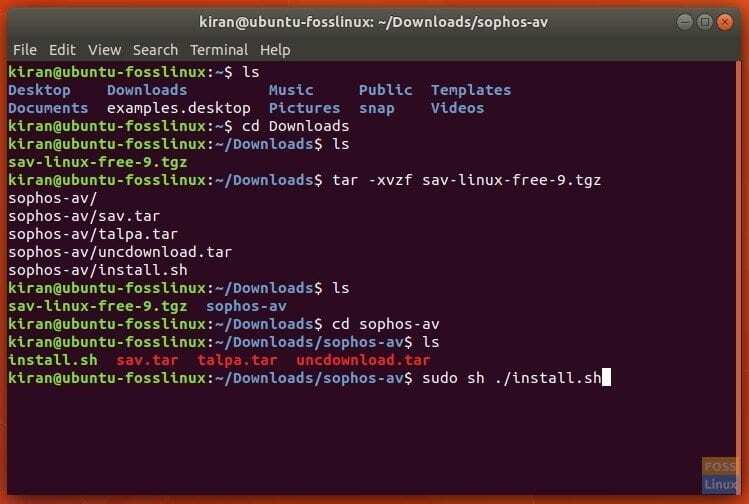 It was very easy to install sopho after reading your post. But, have you any idea why i have this messages in the terminal when i try to enable and start on-access scanning? Failed to enable on-access scanning.